Located in London (London City Centre), Snet Hospitality Kings Cross is within a 15-minute walk of Russell Square and Tottenham Court Road. This apartment is 1 mi (1.6 km) from The British Museum and 1.1 mi (1.8 km) from Oxford Street. Located in London (London City Centre), Snet Hospitality Euston is within a 15-minute walk of Russell Square and Tottenham Court Road. This apartment is 1 mi (1.7 km) from The British Museum and 1.2 mi (1.9 km) from Oxford Street. Mabledon Court Hotel is less than 600 metres from London Euston, King's Cross and St Pancras International rail stations. It has free Wi-Fi, a lift and a guest lounge. The British Museum is just over a 10-minute walk from the hotel. The Mabledon Court Hotel is in the Bloomsbury district of London. The British Library is only a 3-minute walk away. The en suite rooms have TVs, telephones, hairdryers and tea/coffee. Some double rooms have garden views. A Full cooked English breakfast is served and includes sausage, tomato, baked beans and eggs. A lighter continental breakfast is also on offer and consists of cereals, yoghurt, toast and jam. 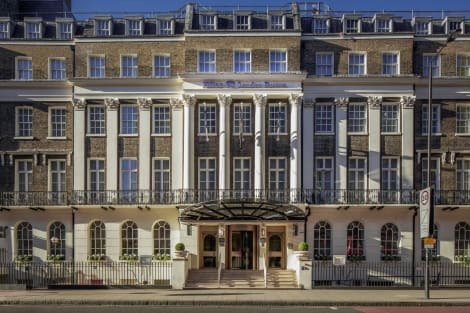 The 4-star Hilton London Euston is set within a stunning Victorian building, just a short walk from Euston and King’s Cross St. Pancras stations. Start the day with breakfast in the Mulberry’s Restaurant, sample a tempting menu of international cuisines in the grand surroundings of the Woburn Place Restaurant or unwind in the cosy Woburn Place Bar and Lounge. All rooms at the Hilton London Euston have wi-fi access, LCD TVs and private marble-finished bathrooms. A stay at Judd Hotel places you in the heart of London, within a 15-minute walk of Russell Square and The British Museum. This hotel is 0.6 mi (1 km) from Tottenham Court Road and 1.3 mi (2.1 km) from Royal Opera House. Make yourself at home in one of the 31 guestrooms. Complimentary wireless Internet access is available to keep you connected. Conveniences include phones, as well as desks and coffee/tea makers.